Every now and then, something happens that is absolute magic. It may be that one lesson or activity that you stayed up three nights in a row to create or the one you created on the fly to respond to a need but every now and then it just clicks in all the right ways. Back in October, I was working with Amy and Margot (@mags_cimba) members of our @HWDSB program team, and we were brainstorming ideas to engage students regarding our partnership with the Hamilton Bulldogs and the 2nd annual Literacy game. For this event, students in grades 4, 5, 6 are transported to Copps Coliseum in Hamilton to watch a hockey game and to participate in a variety of literacy activities prepared for the day. In the previous year’s event, students were given opportunities to interact with players of the Bulldogs and to participate in the game (i.e. dropping the puck, interviewing players, creating signs etc) by completing pre-game activities in the form of a contest. In an effort to produce the most engaging opportunity for students possible, we opted to not prepare an essay contest (for most students this is the least engaging activity EVER) but to give them a diverse, interactive, multimedia experience that met multiple interests and learning styles, and that provided an opportunity otherwise impossible (for me, the purposeful use of technology in education is to add value to learning and to make what was previously impossible possible). To have students blog about why they love the bulldogs and to discuss a particular book and to engage in conversations with the players of the Bulldogs themselves. The students, therefore, would write blog posts in response to prompts (provided to students & teachers weekly on the blog leading up to the event) and just reflect on their own without prompt or provocation, and the players would respond to them – thus providing a personal touch and a sense of authentic authorship. As we continued to brainstorm, we thought about how cool it would be if the hockey players read the book we were going to choose (these are celebrities for these kids after all) and to provide that reading on the web for the students to hear and for teachers to include in their program. The idea was ambitious but we were super excited to make it happen and to give the kids an opportunity of a lifetime. All of this led to Tuesday, November 8th when almost 5000 students and teachers from HWDSB came together for the second annual HWDSB/Hamilton Bulldogs School Game. To start, schools involved were given a book by Canadian author and hockey expert Mike Leonetti. The Goalie Mask kicked off the Literacy component of this partnership. Read-a- loud activities, based on the book, were prepared and sent out to all registered schools. Equity considerations were also included. Embedded in these activities were instructional strategies that teachers could transfer and continue to use in their classrooms. A blog (an online, web-based journal) was created to capture the spirit and the student engagement for the Bulldogs Literacy Game. (http://bulldogsliteracy.commons.hwdsb.on.ca/ ). Various prompts were posted in the days that followed where some students blogged about what question they would like to ask a Bulldogs player while others blogged about how they would feel if they were the one to drop the puck at the game. In addition, other @HWDSB students responded to these posts and the collaborative nature of The HWDSB Commons (our WordPress/Buddypress social learning platform) was evident throughout. 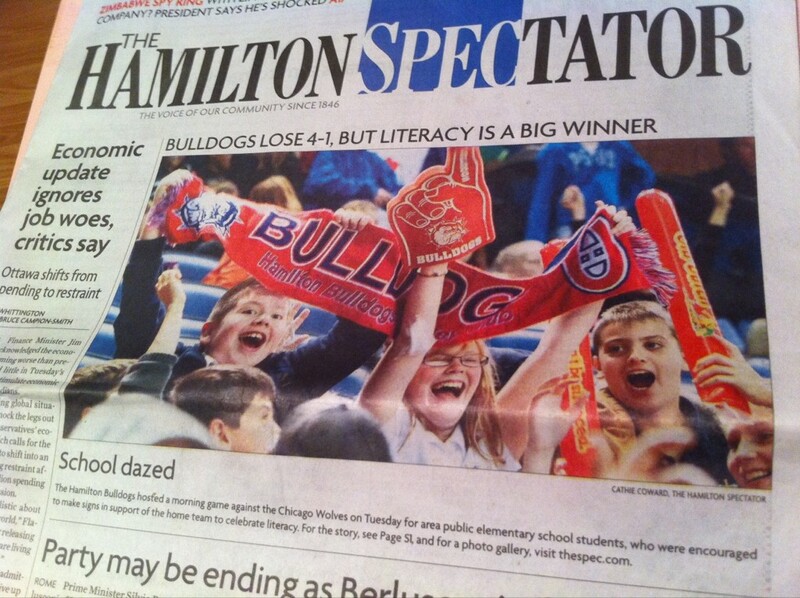 The blog was also the place to see a video of the book being read by Hamilton Bulldogs players (http://bulldogsliteracy.commons.hwdsb.on.ca/2011/10/27/the-goalie-mask-presented-by-the-hamilton-bulldogs/). 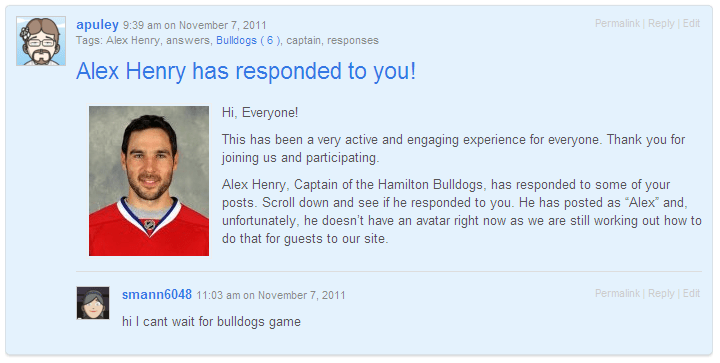 Alex Henry, Captain of the Bulldogs, blogged in response to the students, too. 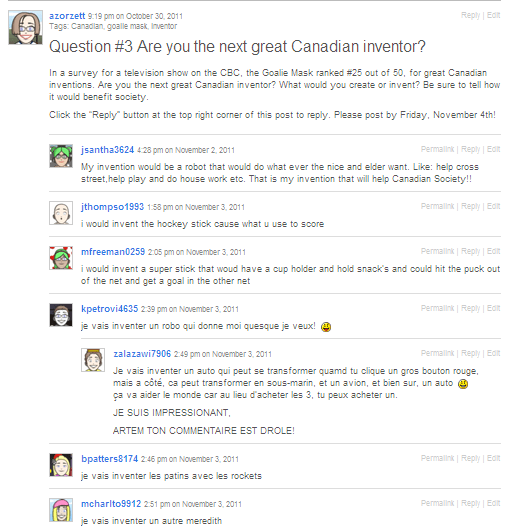 Students posted in English, in French (http://bulldogsliteracy.commons.hwdsb.on.ca/2011/10/31/are-you-the-next-great-canadian-inventor/#comment-215 ), and with their voice via audio recording (http://bulldogsliteracy.commons.hwdsb.on.ca/2011/11/03/dropping-the-puck-would-be/ ). So many potentials for multiple languages and learning styles. Thanks for all your hard work with the bulldogs game today. Our students had a fabulous time and we found the bussing to be a breeze!! The Goalie Mask activities and blog were awesome too – students were very engaged! Great job!!! Students who participated in the blog were entered to win some pre-game opportunities. One student from Queen Victoria, Dariche, was chosen to interview a Bulldogs player, the day before the game, with a collection of questions that were posted on the blog including his own. This video was shown during the game and has now also been uploaded to the blog (http://bulldogsliteracy.commons.hwdsb.on.ca/2011/11/08/an-hwdsb-student-interviews-a-bulldogs-player/). A student from Mountain View, Brooke, was chosen to drop the puck with superintendent, Pat Rocco (@Pat_Rocco), while many other students had the opportunity to sit in the penalty box during warm-up, high five the players in the fan tunnel as players were going on the ice, or watch some of the game from the Press Box. Students were selected to participate in various events during the game including questions linked to the book and the Sign Contest where a student from Cathy Wever won a Bulldogs player appearance at their school. Literacy moments were included throughout the game. Programs of choice in @HWDSB were even highlighted during Intermissions with both Billy Green’s and Sherwood’s Hockey Canada Skills Academy taking the ice. During the game, I ran around and took pictures with my iPhone (using the WordPress app) and they were posted live as the game happened, giving a window to teachers and students alike but, as well, parents…they could watch what was happening during the game and be there without “being there”…a window that makes learning and engagement visible. We are able to share and celebrate the student engagement and capture their excitement from their signs to their cheers. The HWDSB Commons (@HWDSBcommons) affords us an opportunity to engage the entire HWDSB in board events in this fashion – a live news feed. The Hamilton Bulldogs (@BulldogsAHL) were generous in so many ways but especially by offering so many free tickets to students in our Board. Over 800 students in our Board attended the event completely free. Schools that attended for free included Hess St., Dr. Davey, Queen Victoria, Roxborough Park, Cathy Wever and Queen Mary. Many of these students experienced something that they have never experienced before – an opportunity to attend a professional hockey game. This was the first time most of our kids have been to a Bulldogs game and they were thrilled. I wouldn’t change a single detail about the event. It was very well planned – from the permission forms to the book and literacy plans, as well as the many emails with schedules and logistics. I can only imagine how difficult it must have been to organize such a huge event with so many people involved. Everything went very smoothly and we had a great time. I can’t begin to explain how proud I am for how this event played out and how we were able to present an authentic, engaging opportunity for students and to celebrate and display the opportunity openly in a public forum via the @HWDSBcommons, which truly shows the power and purpose for why the platform was created. Whereas an essay contest would engage some, it certainly would not engage all and what we were able to create was an opportunity for students to participate in the way they were most comfortable (writing, speaking via podcast, reflecting in person via webcam, or by producing media products that can be easily shared – uploaded or embedded – on the blog. Everytime I look at my foam finger I am reminded about how cool this event truly was and what is possible for student engagement. Blended learning is about personalized and responsive opportunities for students while meeting diverse learning styles and needs. Here, we were able to use that concept for a learning experience that was authentic, meaningful, and most of all, fun. Learning happens everywhere and is not limited to the classroom any longer! The possibilities are endless. Thanks to Amy, Margot (@mags_cimba), Rob, Pat (@Pat_Rocco), the Hamilton Bulldogs (@BulldogsAHL) and everyone else involved from program and equity for having the faith to try something new and to provide students with an experience that they will not soon forget! The most engaging pieces of this project: an authentic audience, collaboration with multiple partners across the city, a tangible and obvious purpose behind the learning activities, are things we should strive for everyday. Imagine a space where students are excited about learning, teachers recognize, capitalize, and are invigorated by that enthusiasm, and the opportunity to share and celebrate in that learning is easily accessible. That’s the kind of environment we should all strive to create for our students. This is a truly magical educational experience. It reminds me of the freedom writers. I would wish I was as fluent with this technology as you obviously are. I am a teacher of the Dutch language (in Holland) and teacher’s trainer / educational researcher. A very inspiring website!! Thank you. This project uses technologies students simply consider to be a part of their daily lives. It is incredible to see such authentic learning, engagement, and use of 21st century skills. Community involvement and support by the Bulldogs helps students build their critical thinking skills, communication, and teamwork. Having students participate and experience in this project allows for a genuine learning experience. Offering students an avenue that speaks to them to interact and engage in material rather than one size fits all rote learning is the essential transition we need to see in education and school systems. Thank you!